Have fun and the opportunity to win cash prizes when you play 95.3 CreekFM’s Radio Bingo! See below for rules and regulations. Before you buy your bingo card, please ensure that you can tune in 95.3 FM on your radio where you’re planning on playing. 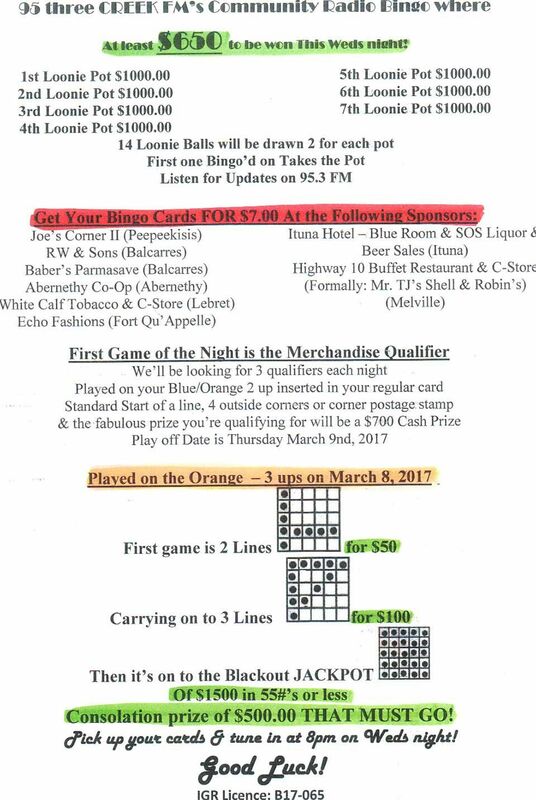 All players must be able to call into Creek FM to stop bingo play. 306-334-3331. Cellular telephones, service and batteries have proven unreliable, so Creek FM recommends all players to please have clear working land lines. Last number called must appear on all bingos. Creek FM also reminds players that online bingo play has a compression delay, therefore is unreliable as next number may have been called. First Loonie Ball bingo-ed on takes the pot. Depending on the bingo, it may be possible to bingo on the second part before the first. If you have a bingo, call the station to stop play and have your bingo confirmed. The next number out will invalidate it if you wait. All winning cards must have the 95.3 Creek logo stamped on them. This is done before they leave the station to our sponsors. The winner’s contact information, serial number (on outside of card starts with SER and is 6 digits long 123456) of cards and winning card number (is located in the free spot and/or the lower right hand corner of the winning card) are required for verification purposes to determine a valid bingo. A cheque can be mailed out to you, once your card is mailed to 95.3 Creek FM Bingo, P.O. Box 940 Balcarres, SK S0G 0C0. The Creek logo must be verified to be on your winning bingo card. In order to collect winnings, you must present your winning card. The Creek logo must be verified to be on your winning bingo card. All winnings will be paid by cheque. All winners must be 18 years of age or older to qualify. Immediate family to the witness and caller are excluded from winning due to a conflict of interest.